Presenting fully developed diversity training activities and updated to include advice on facilitating diversity training, including case studies of difficult situations, refined exercises rewritten to include expanded activities, and diversity quotations, this handbook helps trainers and group leaders design and lead sessions that confront problems and tensions. Turning diversity from a challenge into an asset, these compelling, interactive, and engaging activities foster inclusive environments, allowing trainers to raise individual, team, and organizational awareness of a host of diversity issues. Developed to create safe places for dialogue, these activities allow workers to discuss "unspoken" challenging topics, increasing cultural awareness and competence for the entire organization. The guide's analysis of the activities' impact brings a fresh approach to and allows for an evaluation of these training aides. The CD-ROM includes all of the book's diversity activities and templates for announcements, memos and reports. - Raise individual, team and organizational awareness about a host of diversity issues. - Create safe spaces for dialogue about often "unspoken" and at times challenging topics in the workplace. - Increasing cultural awareness and competence among individuals, teams and organizations. The chapter on Diversity Facilitation Skills shares the lessons learned by the authors in over 30 combined years of diversity leadership in discussion and real-life case studies. The accompanying CD-ROM contains all 50 exercises and additional resources that you can easily download and adapt to your own needs. 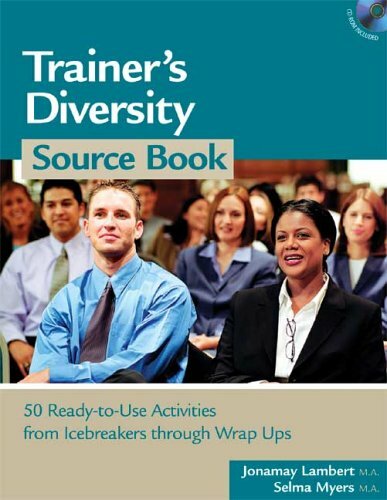 Written for human resource professionals, consultants, trainers, and anyone who is faced with the task of corporate diversity training, the Trainer's Diversity Source Bookand its packed CD-ROM will save you time and money with its easily adaptable techniques and templates. Jonamay Lambert M.A.^Selma Myers M.A.